History Benefits of a Co-Op PCPO Member F.A.Q. Linda Romanowski is a masterful sculptor of learning environments for children that offer rigorous academic opportunities within a playful context. She listens intently to the ideas and passions of children, brings these ideas together in collaborative inquiry, and builds scaffolds that differentiate instruction to meet the needs of every child. She has researched and implemented the very best educational practices to design a Kindergarten program that is child-centered, academically rigorous, and developmentally appropriate. 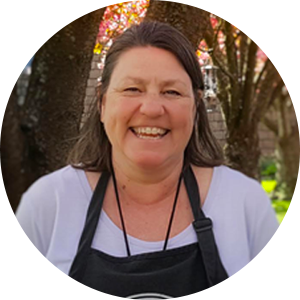 Linda Romanowski is holds a Masters of Education in Reading from the University of Arizona, a BA in Elementary Education from Purdue University, and her Oregon Teaching License. In both 2009 and 2013, Linda was awarded the Parent Cooperative Preschools International District Award for dedicated service to the cooperative preschool movement. Linda was also the recipient of the 2018 PCPO Robin Garthright Bunster Award. Linda routinely participates in workshops, classes, and conferences to refine her craft. In 2010 she completed the Mentor Teacher training program at the Opal School. Linda brings over 20 years of teaching experience into our classroom, and knows well the minds, hearts, and imaginations of young children. She is masterful at developing strong relationships, fostering independence and self- regulation in young children, building deep and authentic problem solving experiences, and facilitating peer conflict resolution. 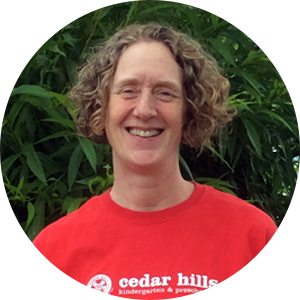 Linda began teaching at Cedar Hills Kindergarten & Preschool in 2002. She has taught the threes, fours, and Kindergarten classes. She is a gifted parent- educator, providing parents with effective tools to support each childï¿½s literacy, numeracy, and language development. She believes the cooperative philosophy builds a strong foundation for life long learners and provides a nurturing space for children and parents to grow together. Lora received her undergraduate degree at the University of Oregon. She subsequently attended San Francisco State University where she received a teaching credential with a bilingual, cross-cultural, language and academic development emphasis. Her continuing education has focused on language development, music and movement with children. She is a Positive Discipline trainer. Lora began teaching at Cedar Hills Kindergarten & Preschool in 2004 as the Threes class teacher. She has two sons who attended cooperative preschools in Portland, where she fell in love with the parent cooperative model. When Lora is not teaching, she makes time to parent, cook, read, play banjo, practice yoga, garden, experience the great outdoors, and travel. Julie’s undergraduate degree is from the University of Oregon. She has been an early childhood educator since 1994. She is a trained Kid’s Turn and Seeing My Time facilitator. She is the mother of three children and her eldest child is an alumni of CHKP. Through her exposure to differing early educational settings, she came to the belief that the cooperative setting is the best possible start for families of preschoolers. The children in these environments learn more than the traditional academics. They learn they are capable, contributing members to a larger community. They experience confidence in solving problems and using critical thinking skills. The parents in the cooperative environment also experience success in using the knowledge they gain from parent teaching in their own lives. They learn how to be successful advocates for their children’s future school experiences. As a teacher, Julie feels it is an incredible privilege to be a part of this amazing approach to education that supports the whole family. Cedar Hills Kindergarten & Preschool is a 501(c)(3) non-profit organization.